What better way to start the season than by looking at your closest foes. Since the Caps play teams in their division 8 times during the course of the season, it's only fair to take a closer look at the Southeast Division. So over the next 4 days, we (meaning I) will look at the Capitals' biggest foes. Let's start alphabetically. Atlanta was the darling of the Southeast Division last year, only to get upset in four games by the New York Rangers in thier first playoff series in team history. 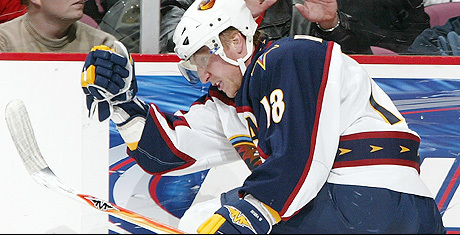 It seemed that the Thrashers had everything going for them into last season's playoff run. But something went terribly wrong. Now, Atlanta needs to prove itself once again. Something hard to do in a division that looks like a toss up this year. The pluses for Atlanta far outweigh the minuses. But this was an off season that saw some good defensive talent looking for greener pastures. The Thrash will be without Andy Sutton and Shane Hnidy. But the Thrash were able to sign Ken Klee, a former Cap and solid defenseman. Both Niclas Havelid and Alexei Zhitnik will be back on the blue line again for the Thrash. The offense is still a threat with Ilya Kovalchuk, Bobby Holik and Steve Rucchin returning. Atlanta also secured a couple of other key forwards to keep a core of the players that helped the Thrashers make the playoffs last year. This team is still a big and very dangerous offensive threat. In goal will be Kari Lehtonen, Atlanta's top prospect will return this time with some important experience. Johen Hedberg is a capable back up for the young talent. Goaltending shouldn't be much of a problem for the Atlanta squad. In the off season the Thrashers did very little, obviously general manager Don Waddell is satisfied his team has a good farm system. "I think we have an opportunity next year. Let's face it, we haven't had a lot of young guys ready to compete for jobs," Waddell told the Atlanta Journal-Constitution at the end of the season. "We think we'll have positions for those guys. We also have a couple European players who are ready to compete for jobs here. I think there are going to be opportunities and availability. It'll be up to those players to take advantage of it." Bob Hartley will surely make this team a playoff contender once again. Atlanta's record over Washington was 5-1-2 last season. Atlanta should finish first or second in the division for the '07-'08 season. The Thrashers will be a tough test for the Capitals defenses. The Caps must be able to shut down the Thrashers offense if they hope to gain an edge on the Thrashers this year. Alex Ovechkin wasn't too surprised about Canada's supremacy in the Super Series this summer. Ovechkin told a CP reporter in Toronto that Canada's hockey program was the better system. Looks like Russia needs to retool. Scott Niedermayer was suspended by the Anaheim Ducks today, a move that was expected by everyone. It may free up some cap space for the Ducks and may be the first move that leads to Niedermayer's retirement.